I dare you to attack Darnassus. I miss using this card. 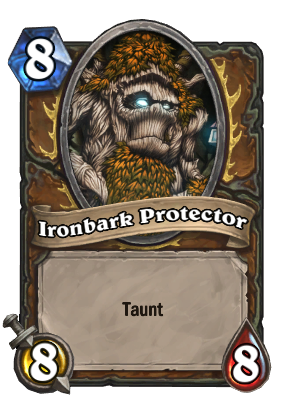 We could use a new "Ancient" creature type with cards to synergize with it so that Ironbark Protector, Ancient of War, and maybe even Ancient of Lore might see play again. And/or emphasize the Lich King powercreep even more by having it give us a random Druid spell at the end of each turn. It's like The Lich King but class specific and it doesn't draw an op card every round. Wouldn't hurt to reduce it to a 7 drop. Meet ironbark's new bestie, Giant Anaconda! Still good. I love this card. Am I the only one that thinks this card looks like geodude? Far from OP, easy target for spell removal/TBK/BGH, I hope you like wasting 8 mana.